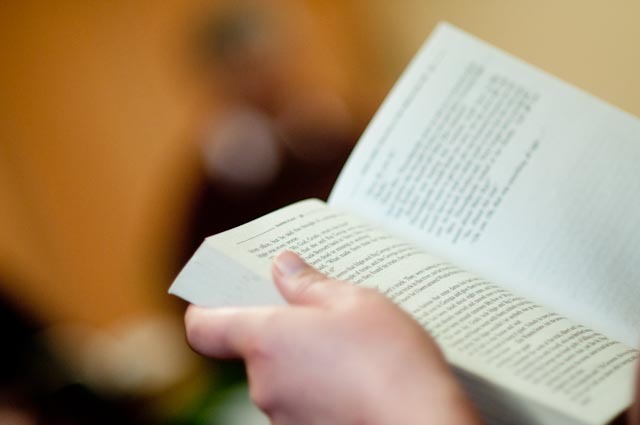 The Reader Organisation runs weekly shared reading groups in the South West of England, with a particular focus on improving health and stimulating wellbeing through shared reading. We currently work in Cornwall, Plymouth, Wiltshire and Devon within libraries and community centres, helping to stimulate memories for people with memory loss and encouraging a greater sense of wellbeing with our Feel Better with a Book groups. In particular, shared reading has been commissioned for recovery pathways across the area, with it being one way of contribution to promoting good health for people of all ages and backgrounds at all stages in life. Quite simply I am beginning to open my eyes as if in a coma for over forty years. Like a person who is discovering his senses I am becoming aware of the wonders of existence that I once took for granted, but that was cruelly snatched from me by adverse circumstances. A blind man who can suddenly see is much more thankful for the miracle of sight and appreciates everything that much more; so it is with me. The part you are playing in this transformation is that I picked up a book (I am Malala by Malala Yousafzai – which seems appropriate) and for the first time for a lengthy period of time began reading, with an awakened thirst for knowledge, enthusiasm, and much anticipated interest; something I have not done till pre-breakdown times, stretching back to 1972. This might seem like an ordinary event but it makes a significant benchmark in my progress back to health. Your encouragement has inspired me to voluntarily pick up a book (which I have found impossible to do for a long time) and has renewed in me the urge to resume the old habit of reading. I was once an avid reader but my brain just shut down on the advent of the illness. I am once again discovering the joy of settling down to a good read. All this might appear trivial, but I thank you for instilling into me hope and making the impossible a real possibility. We wish D all the best on their continued journey and discovery of a reinvigorated love of literature.